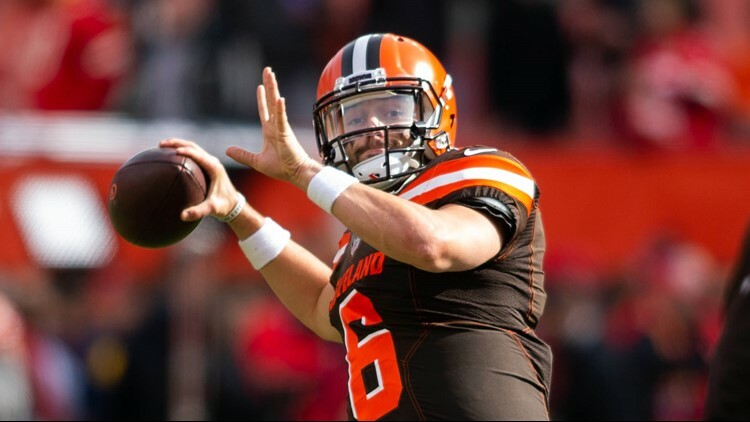 Browns quarterback Baker Mayfield can stand taller in the pocket with a little more help from his friends and coaching staff. CLEVELAND — Remember Jarvis Landry’s boast about the Browns rolling up big scoring days on opponents? He predicted offensive greatness long ago, before the Browns traded Josh Gordon and Corey Coleman. Not that the presence of either should’ve emboldened anyone as much as it did Landry when he said this in late July: "You'll be lucky if we don't score 40 on you. If we get everyone playing to their potential, we can win the Super Bowl this year." Since Tyrod Taylor was the quarterback at the time and Gordon had already announced by then he wouldn’t make the start of camp, it’s fair enough to wonder what Landry saw that we didn’t. Teams in possession of that kind of offensive potency — as we saw Sunday when the Chiefs came to town — have game breakers like Tyreek Evans and Kareem Hunt and schemes that create mismatches. They have players who are a blend of dependability and greatness, like tight end Travis Kelce. And Cam Erving starting on the offensive line. Wait. That part can’t be right. The Browns scored 21 against Kansas City and should’ve had 24 if they weren’t so bent on trying to master the two-point conversion. So that wasn’t bad. But they managed 18 against Pittsburgh (only 12 when it really mattered), 14 against the Chargers, 12 against Baltimore in overtime. Imagine if the NFL didn’t make it so easy to score points in 2018. It says something about Baker Mayfield that his lack of size has never been a topic of discussion this season. That the only time stunted growth has come up, the conversation is what the divided coaching staff and surrounding talent have done to him. Interim head coach Gregg Williams says the next step for Mayfield is for the rookie quarterback to understand that the organization has his back, that it’s OK to play free and easy. “Now, let’s go,” Williams said in a Thursday press conference. “You are a smart enough quarterback, instinctive enough quarterback. We understand that mistakes are going to be made. Do not be afraid of making mistakes. Just cut it loose and play, and make faster and faster decisions. And the exact opposite of the message delivered to a year ago to DeShone Kizer, who understandably played as if every errant throw would require him to give a pound of flesh. You could find 50 things that made you scratch your head about Hue Jackson’s time here, a tenure that began with Browns employees lining up upon his arrival looking like the French when Lindbergh landed. Like Jackson and the Haslams thinking it was an appropriate look and not at all clownish for a NFL coach to jump in the lake after a 0-16 season. Like Jackson’s delusional talk about winning the Super Bowl, telling the rest of the league that it should have its fun now because, you know, the tide was turning. As the Browns were in hot pursuit of a 1-15 record. That he showed up saying the Browns were “chasing greatness” and left after 2 1/2 seasons of the Browns chasing their tails. The whole “earn your stripes” silliness from training camp. One of my favorites, though, happened this year when Jackson decided he needed to warn players about bandwagon fans. When the Browns were 2-2-1. That seems to have worked itself out. I know it was campaign season but I’m not sure I’ve seen a quarterback stump for a left tackle the way Mayfield did for Greg Robinson after the Chiefs game. No offense to Desmond Harrison, but Mayfield clearly approves Robinson’s candidacy. So the Indians are willing to listen to offers for Corey Kluber and Carlos Carrasco? I know it's been a rough month or so sports-wise around here but doing diligence shouldn't put them in the same "Only in Cleveland" conversation with the Browns and the LeBron-less Cavs. At least until they fire a head coach six games into the season or go off in search of their fifth manager in six years. The Steelers scored 52 points on Carolina Thursday. It was their highest point total since 1984 when they put up the same number. I know what you’re thinking. But, no, it wasn’t. It was against the San Diego Chargers. Ben Roethlisberger had a perfect passer rating against the Panthers but said the offensive performance didn’t feel like perfection. “There’s still some stuff out there,” said Roethlisberger. He is said to be working out in a Pittsburgh fitness center. We don’t know if he’s ready to carry a heavy load anytime soon. But we do know he’s turning Twitter upside down. I agree with Joe. Someone should tell Bell to please return his Tweets to their original upright position. Or more people are going to get hurt. Cavs head coach for now Larry Drew pulled some veterans aside in Orlando to remind them that Collin Sexton is a rookie. Some Cavs vets let it be known they think Sexton is ill prepared for the league, doesn’t know how to play the NBA game and doesn’t always take advice in the spirit it is intended. Drew’s message to “go easy” was needed. Sexton is just 19. Give the kid a break. Imagine playing for this team and not being able to drink. The Cavs introduced their new city uniforms. Included is a “one out of five greats” tag, a reference to the Lake Erie wave across the front. They will wear them six times. All six are home games, starting Nov. 13 against Charlotte. I didn’t like the uniforms when I first saw them. Or when I second saw them. The design might look like the Cavs are reaching for something. But they are actually counting on a near certainty. That the uniforms will grow on you faster than the roster will grow on you. Kyrie Irving wasn’t happy that Denver’s Jamal Murray launched a three-pointer with one second remaining in a game already decided. Murray had 48 points and was obviously looking to break the 50-point barrier. Not sure what breach of decorum was worse, but one of them got fined for their heave and it wasn’t Murray. Somewhere Ricky Davis is pretty sure Jamal Murray did nothing wrong. Three days after the difference of opinion, Irving accepted his $25,000 fine for throwing the ball in the stands but didn’t back off his assessment that Murray “disrespected” the Celtics by shooting that last shot. Irving admitted he earned the fine for recklessly throwing a ball into a crowed of people. Knowing, as all science buffs do, the effect of gravity. Panthers defensive back Eric Reid got ejected after a hit on a sliding Ben Roethlisberger Thursday. "I didn't even know you could be ejected in the NFL," Reid said. The way things have gone with officiating this season, you probably can't. And Reid can expect an apology sometime next week. The Browns have lost four in a row. A bold man would pick a Cleveland win Sunday. Bolder than I'm feeling based on a record of predictive success that's even worse than 2-6-1.